If it sounds fanciful, it’s not. It’s a simple matter of charging more for your services. But it’s not something that just happens — you’ve got to intentionally position yourself in a specific way to receive higher fees. Today we’re talking with Ed Gandia about how to get higher-paying clients. There are a lot of freelancers who think they can’t charge more due to competition, or because platforms like oDesk are commoditizing creative work. Ed knocks down these common objections, and shares the sweet spot that even “non-rock-star” service professionals can attain when it comes to charging more. Plus we explore the four simple steps it takes to get there. Ed Gandia: Hi, this is Ed Gandia with High-Income Business Writing. I help writers and copywriters earn more in less time doing work they love for better clients. And, God help me, because I’m definitely unemployable. Brian Clark: What if you could work the same amount as now, but make more money? Or what if you could work less and still make more money? 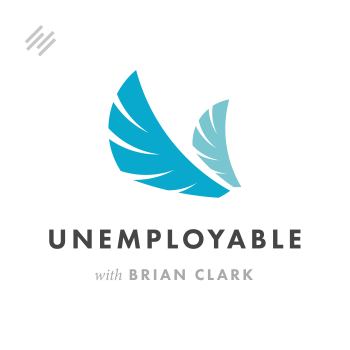 I’m Brian Clark and this is episode 106 of Unemployable. Ed Gandia: I’m doing great, Brian. Thanks for having me. Brian Clark: Excellent. Just been a couple of weeks or so since I saw you in Delray Beach, Florida for that copywriting conference that we were both at. This topic always comes up when you’re surrounded by freelance writers of various stripes and expertise. They almost have this common struggle and it’s not to put it off of us too. Because when I took clients, I struggled with charging more or enough, when I was in those contexts. But, you know, this is kind of endemic or systemic when it comes to writers trying to price their work. Ed Gandia: Yeah, it really is. And it’s funny, because I think it’s two things. It’s getting clients and it’s getting better paying clients. Consistently, every time I survey my audience in conversations with writers and copywriters at all levels, the number one challenge they have is getting more and better paying clients consistently. I mean, the second problem they mention is not even close. So, yeah, this has been a universal challenge for a long time. Brian Clark: Yeah. I guess we all start at the point where it’s, “Just get me any client. I’m just starting out.” But even that is a dangerous mindset. Ed Gandia: It really is, because it’s very easy to stay there and just be content with just making a living and just assuming that everyone else is doing better, “They’re luckier,” without realizing that this is really within your control. What Assumptions Do Freelance Writers Make? Brian Clark: Yeah. And we spoke about this, but what you just did there is outlined one of the assumptions that freelance writers will make. There are other ones too. Give us a feel for that. Ed Gandia: Yeah. I believe we can’t really start talking about solutions to this dilemma until we address some of the assumptions. I think many of the assumptions that freelancers make — and listen, I’ve been there, so this is coming from someone who knows very well what the excuses are, what the assumptions are. These are the things that are keeping you from doing the things that you need to do to get out of that cycle. One of the biggest ones I see is this assumption that there’s just too much competition out there. That there are just way too many freelancers in the market, too many low cost offshore providers, and that this is bringing down rates and fees and there’s just no way to counter this. Now there is some truth to that, but as we’ll talk about here in a few minutes, a lot of that is just absolutely not true. A related assumption is that websites such as oDesk and other job project boards like that are commoditizing freelance work by creating an ultra-competitive environment. You could say the same thing about content mills and how they’re commoditizing freelance writing services. Because of this, a lot of us feel, a lot of freelancers feel that clients are not recognizing our true value anymore, and they’re not paying us accordingly. Then there’s, I think along with that, a related assumption that economic uncertainty is putting a squeeze on everyone and making it really difficult or even impossible to land good projects, good clients, good fees. Brian Clark: Yeah, and we both know both of those assumptions — I mean, they’re based in truth, that’s why they’re there. And yet, everyday people overcome that and position themselves differently. Let’s unpack the competition issue a little bit. Ed Gandia: Yeah, this changed my world. When I finally understood that not all freelance work is created equal, my world changed. Not all clients have the same needs, not all clients have the same expectations or even willingness to pay good fees. What you typically see out there, Brian, is four different levels of client work and fee levels. I’m going to start at the bottom and work our way up. Ed Gandia: The first of these levels is the Bargain Basement Level. This is where a lot of us think of when we talk about work being commoditized and clients not willing to pay good rates. In all fairness, this is where a big chunk of the freelance work resides. At first sight, when you look at this level of the market, segment of the market, it may appear as though this is where you want to compete, because there are so many clients there looking for freelancers. But just because there are so many clients and prospects there, it doesn’t mean that that’s the kind of work you want, because it’s so low paying. I remember back when Elance was publishing on their homepage the number of projects and the number of freelancers on the site. I never understood why they did this, because what it showed me, at first glance, is the ratio of work to service providers. And they had this on for years. They eventually took it down, I think they wised up. But it was about a 10:1 ratio every week. 35,000 freelancers vying for about 3,500 projects. I mean, how can you possibly compete? The tendency is, “Well, this is where the clients are.” Yes, but look at who you’re competing against. This is a race to the bottom. So bottom line with that level is, this is not where you want to go, but this is where so many people think, they assume that the market is made up of that level alone. Does that make sense? Now, flip that over and choose who you want to go after. It can be a combination of who you are as a person, your core values, but also your belief that your work matters and is valued. Ed Gandia: Absolutely. And keep in mind that this is just one level. This is the one that gets all the attention. But there are three other levels. Ed Gandia: The next one up from that, Brian, is what I call the Vendor Level. This is a little better, but not that much. Clients in this space are not necessarily looking for bargain basement work, they’re not looking for the lowest cost provider. They recognize they want better quality, they’re willing to pay more for that, but they still treat freelancers just as vendors, as people who are pretty much all about the same and can be easily replaced, shopped around anytime. The clues that you have a prospect along those lines, by the way, is, “I need a bid from you.” I hate that word bid. It feels like we’re going to be put in some kind of competition. This is someone who’s not going to necessarily an Elance or an oDesk, but they’re shopping around. They may be talking to three or four people and price might not be the top consideration, but it’s up there. And that’s going to be the main factor in their decision. Ed Gandia: Now, above that level is where I feel the sweet spot really is. And I call that level of the pyramid — keep in mind, we’re going up the pyramid. So, as we go up, notice that the number of opportunities are decreasing as we get to the top. Trusted Expert Level is where you start seeing an inflection point in the client to freelancer ratio. So the first two levels we talked about, there are way more service providers or freelancers than there are opportunities. But here, you have more potential opportunities than qualified freelancers. This is a place where, or segment of the market, clients are not necessarily interested in getting bids from five different service providers. They don’t have the time to do that. They don’t have the desire to do that. What they want is to partner with someone who can who can add tremendous value. Somebody who they can turn to, somebody who is going to be a key member of their team in some cases. Now price, of course, is a factor. I’m not saying you can charge whatever you want, but it’s one factor of four or five other key considerations. If you’re going to play here, this is where you can really need to leverage your background, track record, experience. What are the other things you bring to the table other than persuasive writing, other than great copy, other than great content? This is where all your years working in different industries and working with different clients, you really need to highlight how you can leverage that and add value to this particular client. Brian Clark: So what’s above the Trusted Expert? Ed Gandia: That is what I call the Rock Star Level. Brian Clark: Okay, now we’re talking. That’s what we teach. Get to that know-like-trust — likable expert, which again, trust — that’s the key element that you’re going to be there, you’re going to be a part of the team, you’re going to deliver. It’s not about, “Can I get it cheaper?” Because who knows if I can rely on both the work product and the professionalism of this person. So, you’re right, that is the place to aim for. Trying to aim right off the bat for Rock Star I think is a little ambitious. Ed Gandia: It is. Here’s what it is and it scares a lot of people. The way you get to the Rock Star Level is through the Trusted Expert Level. After paying your dues there for a long time, eventually stump prospects and clients start seeing you as the rock star. This is really a theoretical construct, of course, but most people are never going to get here. And many people don’t really want to play at the Rock Star Level. This is the top 1, 2, 3% of service providers. But I think if you aim for the sweet spot, like you said, Brian, that’s really where things can become a lot more fun. That’s when you can really command professional level fees, because you’re bringing much more to the table and the clients you’re working with and you’re talking to, they recognize that. So, if you want to be a Rock Star, that’s fine. But you get there through the Trusted Expert Level. Why Doesn’t Commoditization Happen at the Trusted Expert Level? Brian Clark: Absolutely. Now, I know the way I would answer this, but I want to hear it from you, because we both agree that commoditization doesn’t really happen at the Trusted Expert Level. Why do you think that is? Ed Gandia: It doesn’t happen at the Trusted Expert Level, because they’re looking at other things. These are clients who want much more than just a low price. What they really focus on is value. They want someone they can depend on. They want someone who delivers excellent work, but that’s already assumed. Many people are trying to compete on that alone. You have to bring expertise, strategy, creativity. You have to be that person who always shows up is thinking outside of the scope of the project and offering ideas. You’re really going the extra mile and definitely want to hit on that, because there are some things that I’ve identified that help you get to this level and stay there. Brian Clark: Obviously, your advice applies to all sorts of freelancers, not just freelance writers. In my case, when I address that audience, I often tell them to position themselves perhaps not as writers, because the trusted expert is seen as more. It could be a digital strategy which is executed by writing, right? Or a host of different considerations. Do you feel that way too or do you think that’s unnecessary? Ed Gandia: I do feel that way, but I also look at what’s working out there. Many times, the best way to get in the door is with something a little bit more tactical. And once you’re in there, once you’ve earned their trust and they like you, you can now start talking higher level work. Now you can offer ideas and talk strategy. I think maybe the happy medium is to talk about both when you’re positioning yourself, but don’t necessarily lead with strategy, strategy, strategy every time. Because let’s face it, many times what the client needs is something immediate. “That’s fine, Ed, but what I really need is I’m looking for someone to help me with this white paper.” Right? So get in the door with that and then work your way up. Brian Clark: I think you’re right. I think you do make them aware that you’re perhaps larger than that single task. But, of course, getting your foot in the door, this is the way the trust is solidified. You actually delivered, they’re going to keep you on for the next thing. Ed Gandia: Absolutely. And many times you can show them that. It’s not just telling them on your website, but if you’re having a conversation — I think so many writers out there are order takers, essentially. “Okay, tell me what you need written and I’ll write it for you, Mrs. Client.” Instead of, “All right, this is what you need. All right, so tell me where does this fit within your strategy? What are we trying to accomplish here? What comes behind it? What goes in front of it?” And not going too far deep in the rabbit hole, but you need to understand if you can show them that you think beyond what’s needed right now, they start thinking of you a little differently. What Are Your Top Tips to Make This Happen? Brian Clark: Yeah, I agree. All right, well, let’s get a little more granular here. Give me your top three or four practical tips on making this happen. Ed Gandia: I’ll give you four and we can dive into them in detail if you’d like. The first one is developing absolute clarity about your ideal client, your ideal target market. The second one is going after what I like to call hungrier markets. Number three, developing a systematic way to attract great clients. And number four, delivering extraordinary service. Brian Clark: Yeah, I definitely want to drill down deeper on this. We just did a whole episode with another person who’s actually in the coaching market, about the ideal client and I just think we cannot talk about this enough. I’d love to hear your process for that, because what worked for one person, may not work for others. We know almost universally that if you match up well with that client as opposed to just taking anyone, that’s where the higher paying work comes, but also the satisfaction, right? Ed Gandia: Oh gosh, yes. This is supposed to be fun. Part of the reason we went out on our own is flexibility, but also because we wanted to have a different lifestyle. In terms of developing that clarity, first of all, I should say that everyone should be able to quickly describe what they do for whom, what makes them different and why that difference matters. If you’re looking for maybe a different way to think about your target market and how to position yourself, those are the four pillars that I think through. But the ideal client profile is the “for whom” part of that. The “for whom” pillar. You need to be very, very clear about this. Now, as your business grows, this will evolve. I know when I first started out, and I know you did too, right, Brian. At first, you have this idea, but then you refine that. You eventually maybe even pivot it a few times. Ed Gandia: Here’s what I like to do. I like to write an actual persona, as cheesy as it sometimes sounds. Brian Clark: It’s indispensable. I treat it as a character and a work of fiction. Then, as you put it out there, it becomes more and more real, because you are testing out a hypothesis. I mean, it’s an educated guess. But again, if you’re choosing who you want to work with, then you should be able to paint a picture of who that person looks like. Ed Gandia: Absolutely. And you know what? You know when you’re talking to them too. If you’ve gone through this exercise, you really do. Let me read you one of my ideal client profiles. And I’ve abbreviated this a little bit. My ideal client is a medium-sized to large software company. My primary contact has a significant amount of decision making ability. She or he can make copy decisions on her own without resorting to a review committee. She also knows what she’s looking for and she consistently communicates her need and requirements. She values me as a key member of her team. So my fees are not an issue. She sees them for what they are, fair and reasonable, especially considering the unique perspective I bring to the table as an experienced marketer and sales professional, because I spent 12 years in corporate sales. Finally, my ideal client has a steady stream of work for me. She doesn’t come to me with just a onetime need. She sees the quality of my work and the results I help produce, and she continues to send her work my way. Brian Clark: Now, do you ever drill down even into psychographic aspects of the client rep? I guess that’s premature at the first draft. But something that we stress all the time is that brands can afford to be afraid of saying the wrong thing by actually having a voice and all that. To me, I couldn’t work with a person who was afraid to be expressive and creative and have a voice that resonates with people. So I would probably throw in something like that, because that would make number one, they would value my work. And number two, we would succeed. Because back in the old school, copywriters, even now today, they’ll pick and choose those clients based on the product and the willingness to do something innovative, because they know their reputation grows by wins and they take a hit, even if it’s the product’s fault. Ed Gandia: Yeah, absolutely. So in all honesty, I have about three of these. Here’s the way I did it and I think this is a very natural way to do it. You start with one, wherever you are in your business right now, and then you continue to revisit that as you work with more clients. What happened was after a couple of years, I had had some really bad experiences and some amazing experiences. What I did is I looked at the ones that were amazing and I developed personas for those. And some of them were so unique. That’s why I ended up with three, because I couldn’t morph them into one. I’ll give you an example. One of them, he actually had come from sales and became the vice president of marketing. That is so unusual, but he had some characteristics because of that that made me a perfect fit for him. I loved working with the guy, still to this day, has always been one of my best clients, and we became friends. So I think this is an exercise, many times you connect the dots looking back, right? As opposed to looking forward. Brian Clark: And it evolves over time. You’re constantly refining it, so you can keep this person in your mind when you’re crafting content. Then also when you’re communicating with them, you’re completely cognizant of your relationship with them that focuses on them more than yourself. But you’re the one who gets the benefit. So it’s a good deal. Brian Clark: Let’s talk a little bit about going after hungrier markets. What does that mean to you? Ed Gandia: When I talk about hungry markets, I’m talking about markets that would be willing to pay more for your services. In many cases, you’re talking about offering the same or similar services to other audiences. These are markets that can pay you double or triple what other lower paying markets would pay you all without working any more hours than you are today. I’ll give you a few examples so you see what I mean. Probably the most classic example for writers, if you’re trying to write for magazines and trade publications, that is a dying market. We all understand that. So if that’s how you want to make a living, there are pockets out there, but those pockets are dwindling. Now if you take that same skillset and write white papers or case studies for the corporate market, you’re talking about 2x, sometimes 3x the value in terms of your fees. Ghost writing books for high-end established consultants versus doing the same thing for coaches who are still new to the game. Just because they need you, it doesn’t mean that they’d make great clients. So one has bigger budgets, the other one doesn’t. Writing white papers for medical device companies instead of feature articles for B2B healthcare publications. Again, struggling industry. There are a lot of examples out there, but sometimes the problem is a one-track mind. We think, “Well, this is the market I know. This is the only thing I know.” But if you look at adjacent markets like in that healthcare example, medical device companies versus healthcare publications, it’s the same topic, but you’ve got an audience that’s willing to pay a heck of a lot more for the same skillset, the skillset you already have. Brian Clark: Got It. I mean, who would say no to that? It’s just the key of confidence, or identification and confidence in that order, I would guess. Ed Gandia: It really is. Brian Clark: I think you mentioned your third one was something about marketing systems. Now, back before Copyblogger, I was great at that and terrible at management systems. I’ve told this story so many times just to remind people that everyone screws up. We all have to learn the same lessons one way or another. Sometimes you’ve got a great marketer, other times you’ve got a great operations person. Rarely do I see that being one person. It happens, but it’s not common. Since we’re talking about attracting better clients, let’s focus on those marketing systems. That’s why you continue to see the ebb and flow of work, because if you only prospect for clients when the well is dry, then you’re going to take the first thing you can get at the worst possible fees potentially, and now you hate your life. And so it creates this vicious cycle. I think you need to figure out, “Okay, what’s working for me?” And look back — this could be its own episode, this discussion — but one of the first places you could go is look back at the past two years, every client that you’ve worked with, and then give them a score. Maybe an A, B or C or an A through F. Then just focus on the As and Bs, and ask yourself, “How did I find that client? Did they come to me? If so, how did they find out about me? And if I went to them, how did I do that?” That’s going to start giving you a better picture of what’s working and not working. I’m a huge proponent of what I call warm email prospecting, which is like cold calling with email. But it’s so extremely personalized. It’s not spam. You’re actually doing your research and approaching prospects individually with a relevant message. The thing I like about that is it’s very repeatable. Which leads me to the next thing – you’ve got to turn it into a habit. This cannot be one of those things where you only do it when you need the work. You need to program yourself just like you just get up and put your shoes on and you go straight to the gym. It needs to be that automatic and doesn’t need to be a ton of time. One of the things that a lot of people do that works really well is every day there’s a theme. So, Mondays, I’m doing prospect research. Tuesday, Wednesdays and Thursdays, I’m sending out prospecting emails or maybe sending out some letters. Fridays, I’m doing content marketing or maybe Friday is my networking day, whether it’s online or in person. But if you have themes, if you have habits, if you have rituals, then you don’t have to think about it, you just get it done. Brian Clark: Yeah. From a content marketing standpoint, habit means consistency. It’s going from, as an analogy to the way you talked about, “Oh, the well is dry, I’ve got to do something.” It’s a shift from campaign thinking to consistent production. It makes all the difference in the world, because you’re not panicked. You’re not pulling an all-nighter, because you don’t have any clients and you’re just scrambling to create something that will attract someone, or whatever the case may be. Consistency, little baby steps everyday will totally dominate compared to that panic mode type marketing that we get into. Ed Gandia: Oh my gosh, it’s like compounded interest. It really builds on itself. Brian Clark: Absolutely. Then the fourth thing you mentioned, I think to a certain degree has to be regarded as par for the course. Really delighting your clients, not just with your work product but the way you interact with them. For me, that would be the hardest thing to do, because I’m more of a product guy and I did that on purpose. But when I did have clients, I always went the extra mile even though I was working so much, I was miserable. Ed Gandia: Yeah, you’re right. Sometimes you bend over backwards. Brian Clark: And that’s where the systems on that end come — from onboarding to client interaction and relationships, really, the more you can turn that into a process, the less likely you are to have poor interactions, I think. Ed Gandia: It’s true. And here’s what I found, there’s really not a lot of competition in this area. I hate to say it, and you know this, Brian, because you work with a lot of freelancers. I am shocked and appalled by the low level of professionalism. Generally speaking, I’m not talking about anyone in specific. But act professionally at all times. Do what you say you will do. Be flexible, because not everything, not every project works out perfectly. Sometimes there are changes, things evolve. You have to be flexible, you have to be a pleasure to work with. Then I would add another one, which I rarely see somebody do this, is to take an active interest in your clients’ businesses. I absolutely love my clients. And because of that, I’ve always taken an active interest. By that, I mean I’m always thinking about what they’re doing. I’m always thinking of what else they could be doing, ideas I could bring to the table. I enjoy getting to know their people, their history, their culture, their goals or strategic plans. I think it’s a natural thing. It’s sincere, it’s authentic. I really am interested, but it has had this effect of paying off in a huge, huge way. My clients see that, they recognize it and they treat me as someone who’s part of their team. So I think you need to think outside just the standard stuff and go beyond. The good news, guys, is there’s really not a lot of competition when it comes to these things. So it’s not as hard as you think. Brian Clark: Exactly. I was thinking about that in the back of my mind, because we do get jealous when we’ve got a good freelancer. We want to help them out at work, but you don’t want to share them. Ed Gandia: Yeah. But that means so much to the other person. And then the other person is never talking in terms of, “Yeah, great. Can you send me a bid?” Okay. The way you’ve been introduced and the person in doing the introduction, all that aligns very well with this kind of approach. Brian Clark: You work with a very specific type of freelancer, which again goes back to the writers. Tell them specifically where they can find you and then what’s over there waiting for them. Ed Gandia: Absolutely. Really everything that I have resides at B2Blauncher.com. It’s called High-Income Business Writing. I have a podcast. I put out free information every week as well. Essentially this is all about showing you how to earn more in less time doing work you love for better clients. To me, that’s the Holy Grail, it’s the Holy Trinity, if you will, of freelancing. You can do great work with great people, making great money and not have to work 80 hours a week. You can actually even scale back while you’re income’s going up. That’s the perfect combination. And you know what? The great thing, Brian, as you know, it’s not about talent. You have to be good, of course. It’s really about a whole host of other things that many people don’t pay attention to. So, yeah, check it out. I’d love to have you check out our stuff. Brian Clark: Ed, this has been incredibly useful, valuable information which makes you a great content marketer. Thanks for coming on the show and sharing freely of your time. That’s what it’s all about. It kind of starts with generosity even when you are that expert. It also takes a willingness to help with the understanding that good things will result from it. Ed Gandia: Brian, it’s been an honor. Thank you for having me. Brian Clark: All right, Everyone. We know that it’s about doing great work that we love for people who we enjoy working with, but it’s also about getting paid well, working as little as you want and still making the income that you’re looking for. That’s what you’re looking for with your goals. I think the content that you just received, the processes and the way to think about things will get you in the right direction. No matter what your next goal is, keep going.